What's this? Happy horseplayers? Why the racetracks must be giving money away. EIther that, or someone has paid attention to the needs of these long-suffering, often forgotten supporters of the game. In this case, it's the latter, and the group paying attention to horseplayers was Equibase, the racing industry's data base owned in tandem by the Thoroughbred Racing Associations of North America and the Jockey Club. The Paulick Report has chided Equibase to be more responsive to the needs of the industry and suggested the company focus more on using its data to help build the fan base and worry less about turning a profit for its owners. Shortly after our critique of Equibase, the company announced that it was loosening restrictions on access to historic charts. Most recently, we were pleased to see that Equibase announced a new and improved method of communicating late scratches and changes to horseplayers and fans. We hope these two recent imnprovements in service are signs that Equibase takes its mission seriously. For the online player, reporting of scratches and changes had always been hit or miss. Each and every week we could point to at least a handful of scratches that were never reported at all. Every once in a while we could point out instances of the wrong horse being reported as scratched. The same could be said when it came to reporting of rider changes. Ditto for races off the turf. A little bit of background information about me might be in order here. Back in 2004 I created a module for JCapper called Scratch Bot. Scratch Bot's sole function is to allow the user-player to scour the web for scratches and races off the turf and import new changes as they become available. I'm telling you this as a way of letting you know just how acutely aware I am when it comes to scratches and changes information and just how unreliable that information can sometimes be. To give you an example, when the Breeders' Cup was held at Lone Star Park in 2004, Seek Gold officially finished second in race one, and was part of a $2 exacta paying $970.20, while listed in the Autotote/Brisbet system as a scratch! While chatting with Hank that morning we let him know just how strongly we felt that there needed to be a reliable web-based source for scratches and changes information. While sitting at the table in one of Equibase's conference rooms, I “white boarded” a design for a web-based system capable of getting the job done on a legal pad and showed it to Hank. I even volunteered to stay on in Lexington for the next several weeks (or the entire summer if necessary) to do software development work on the project for free. The page html shows the track name, date and time of the last update, and continuously updated changes for each race. Players can also subscribe to a free RSS Feed. RSS stands for Really Simple Syndication which allows anyone to subscribe to a feed of data using a software client of some kind. What is cool about RSS is that any new information is pushed to you direct. There is no need for you to visit Equibase and constantly refresh the page. Once you subscribe you will just receive an update with new information each time there is a new scratch or change. There are also RSS clients available for mobile phones, so a player wagering on multiple tracks online, at an OTB, or at a track live, can easily receive updates on any or all tracks as well. You can find the most popular standalone RSS clients here. A list of popular mobile RSS clients can be found here. 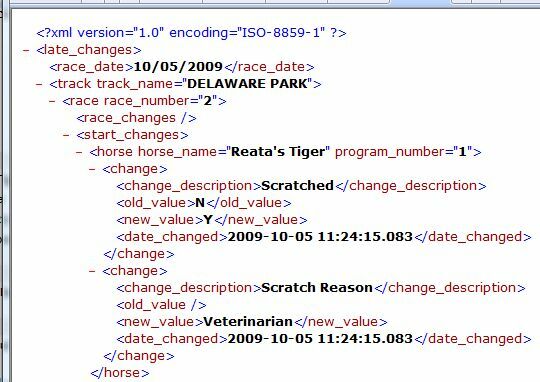 The XML contains nodes populated with information for race date, track name, race number, horse name, program number, change description, and a timestamp. In early meetings with Equibase, everyone was in agreement that a central XML feed was the perfect source data format for delivering this information. In the past, an employee at each track was responsible for letting Equibase know about scratches and changes. At most tracks the employee responsible for scratches and changes wears many hats and is responsible for many different things on race day. Generally that employee could be counted upon to let Equibase know about early scratches and changes. But if that employee happened to be busy later in the day when subsequent scratches and changes were announced, reporting such information to Equibase had always been given low priority. Enter the Equibase chart caller. Before a chart can be cut, all scratches and changes need to be entered into the system. Hank Zeitlin, the CEO of Equibase came up with a novel idea. Instead of waiting until after the race to enter late breaking scratches and changes – why not be proactive and have chart callers enter scratches and changes data into the system as they are announced by the track announcer over the public address system? If that could reasonably be done – then changes could be propagated from the database into the XML and out onto the Equibase site within a second or two after the chart caller clicks the submit button. A designated track employee would still be responsible for entering early scratches and changes. As part of the project Equibase went out into the field and sold the tracks on the idea of giving higher priority to scratches and changes. Responsibility for entering scratches and changes shifts to the chart caller 45 minutes to an hour before post time for race one. In late April, 2009 Hank committed a team of Equibase IT people to making Scratches in Real Time a reality. Hank has kept HANA in the loop and asked for our involvement and input right from the beginning. The system that Equibase has created is more extensive than the one I initially “white boarded” on a legal pad in that first meeting. It contains protocols for error checking/error correction that the initial system I was proposing didn't have. HANA is honestly thrilled with what Equibase has produced. The new Equibase system meets all of the requirements we wanted to see in every way. It is web based. It records scratches and changes in a central database. And it propagates those changes out onto the web within a second or two of when the submit button is clicked. For the online player wagering on multiple tracks the Equibase Scratches Today project is a vast improvement over what was available in the past. As well, for those at tracks or simulcast centers, they now can get accurate real time jockey changes, surface changes and scratches “pushed” right on to their mobile phone, eliminating the need to watch TV screens or visit the posted scratches sheets for their updates. It is our sincere hope that players everywhere will enjoy the benefits of this new system for many years to come. We are also envisioning that tracks, in an effort to cut costs and improve standardization, will move to use the Equibase XML feed as a data source for displaying Scratches and Changes in Real Time right on their own track websites as soon as reasonably possible. This entry was posted in Ray's Paddock and tagged equibase, hana, hank zeitlin, Horse Racing, horse racing data, horse racing technology, horseplayers association of north america, horseracing data, Industry Organizations, jeff platt, Paulick Report, Ray Paulick, technology by Paulick Report Staff. Bookmark the permalink.